Today’s update is to share a wonderful event that is coming up soon. 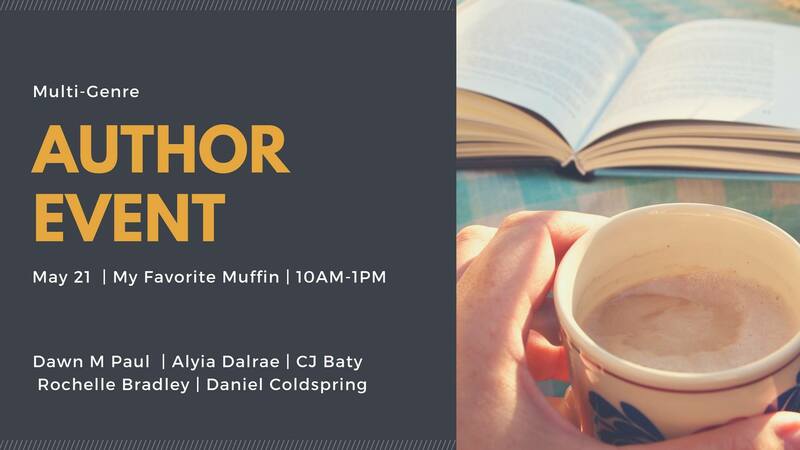 If you’re local to my area here, you’ll have an opportunity to meet up with me, get a book signed, and interact with a wonderful group of four other authors from southwest Ohio, as well as to check our their work. While you’re at it you can grab yourself a cup of joe in one of many flavors, and snag a tasty muffin (or more) that is sure to delight your breakfast (or second breakfast) cravings. Here are links to the Spacepages for my fellow authors so you can have a look see at what they’ve produced thus far. We have a quite a variety here, from my science fiction, to children’s books, romance, fantasy, paranormal, and creative non-fiction. Finally, this here link will take to the event page where you can interact with us and get some additional information about said event leading up to May 21st. Thank you to everyone who has a look at our works and who can make the time to come out and see us.